Copyright of the set is 2016. August 1941 saw the FW-190 become operational and it was quickly apparent that this new aircraft outclassed Allied aircraft. 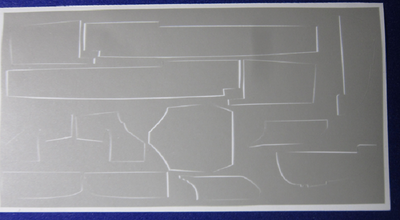 This masking set represents the standard factory finish. Mottling was applied at squadron level and differed between aircraft. Top Notch has tried to faithfully represent the scheme used for this period. The set includes only the camouflage pattern. Serial numbers, code letters and other markings are not included. See Top Notch's website for more. 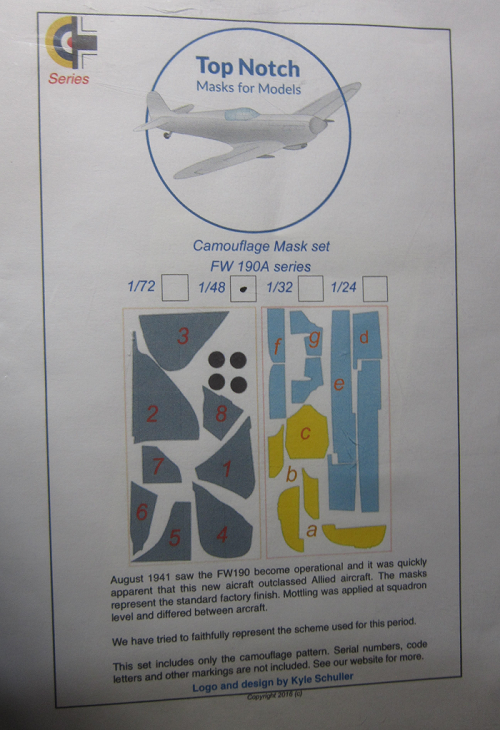 See also Top Notch's Me-262 early mask set TNM-M26. The masking set comes in a clear zip-locked cello bag. 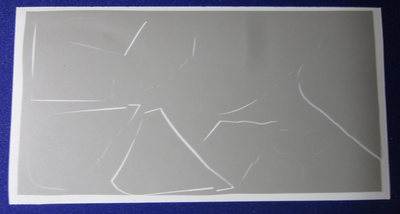 It contains the instructions, 2 grey vinyl die-cut sheets of self-adhering masks, with a stiff sheet. 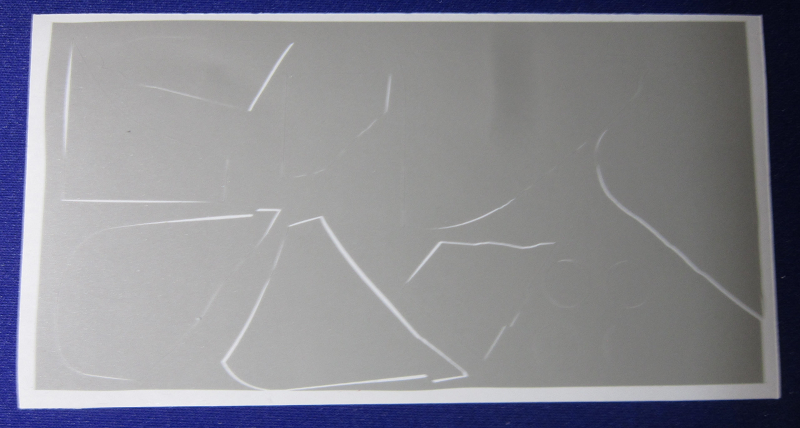 The instructions consists of a single sheet that is printed on one side and folded to fit the envelope. 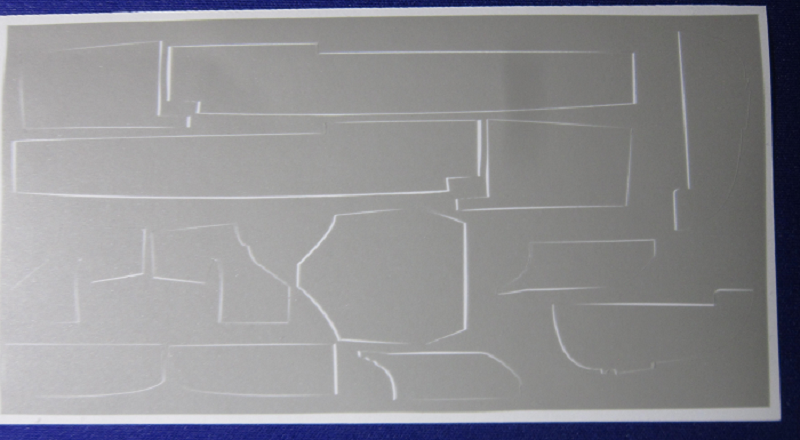 Below this is a illustration of the parts in the masking set. ​There are 8 sections for the splinter camouflage, 2 sections for the straight edge under the top colors, 2 sections for the rudder flap, 3 sections for under the cowling, 4 wheel centers and 4 sections for the spine. 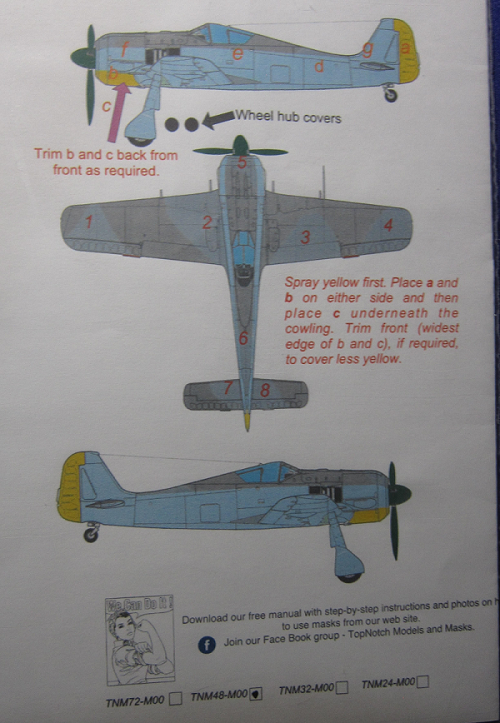 On the left side of the instructions is a 3-view of a FW-190A showing its sides and top. Captions tell where to apply the masks. At the bottom a free manual with step-by-step instructions and photos on how to use the masks can be downloaded from Top Notch's web site.